Chambre Celeste is a cosy and romantic rooftop double bedroom, with mosaic floor and cedarwood ceiling. Easy access to the fabulous terraces. Two huge French windows with stunning 180 degree panoramic views. Small en suite shower and WC. Reverse A/C. WiFi is available throughout the house and, should you need it, the use of a laptop. The rooms are serviced daily. 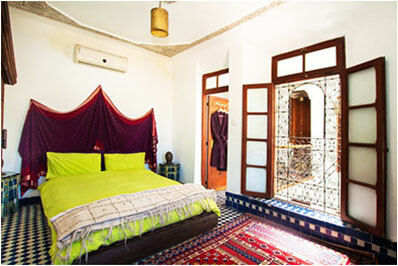 All bedrooms have snuggly duvets, comfy pillows, cool cotton sheets, carpets and blankets. Linen and towels included. Use of fully equipped kitchen. Rate: 45-55 EUR per night, breakfast included. 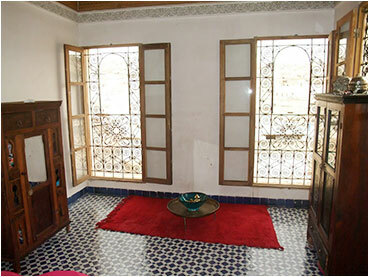 Chambre Seffarine is a cosy and romantic mid-level double bedroom, with mosaic floor and lovely medina view from bedroom. Huge private bathroom with mosaic bath/shower and WC. Reverse A/C. Rate: 35-45 EUR per night, breakfast included. 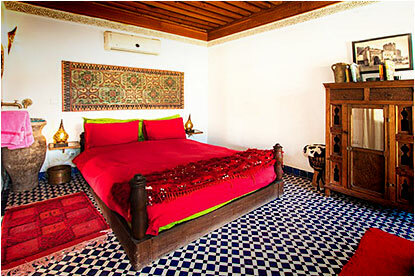 Chambre Tagore is a courtyard level bedroom with mosaic floor. Either two single or one twin bed. Small private shower/washbasin/WC located one floor below. Fan for summer and heat for winter. Our budget room, handy for friends travelling together and guests who prefer less stairs. Rate: 25-35 EUR per night, breakfast included. The entire house is available to be booked and can accommodate up to 6 guests. 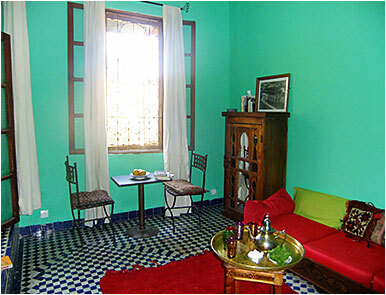 Rates are inclusive per night and are based on the number of people staying and the number of bedrooms required. Rate: 80-120 per night, breakfast included. All rooms are double occupancy. Minimum stay 2 nights. Before booking please note that Dar Sienna is in effect a tower-house, arranged over 4 floors plus terraces and is, regretfully, unsuitable for guests with mobility/fitness/health issues. The courtyard salon is two floors above ground-level and while our stairs do have handrails, no steps, no views! If booking with older children we recommend booking the Chambre Seffarine for the adults and the Chambre Tagore for up to 3 teenagers. 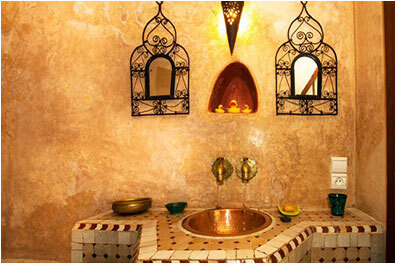 Please also note that Dar Sienna is one of only three properties in the area with running water/plumbing in the house. You will see children going to the local fountain and filling up water bottles to take home for their households. 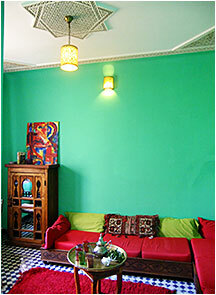 We have installed all modern comforts (electricity, A/C, fridge/freezer, plumbing, internet, etc.) but Dar Sienna is 200 years old and the amenities may experience occasionally foibles. This is Africa, after all - and we are in the heart of a medieval city! Payment accepted via PayPal. On acceptance of your booking, we will invoice you via PayPal in GBP (British Pounds) for 50% of your stay. There is a 5% PayPal charge. 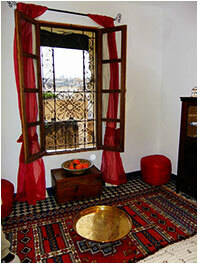 The balance will be payable on arrival, in cash, in EUR, GB Pounds or Moroccan dirhams. CANCELLATION FEE: If you cancel your booking less than 30 days ahead, the full booking fee (deposit) will be retained. We reserve the right to cancel your booking and either refund your deposit or find you suitable alternative accommodation. 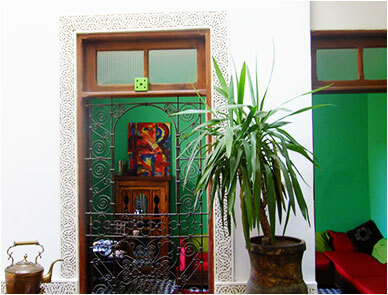 We will e-mail you our House & Cultural Information, with recommended reading, as well as two maps to help you prepare for your exciting trip to Fez. If you have any questions or comments or would like additional information, please do not hesitate to get in touch. 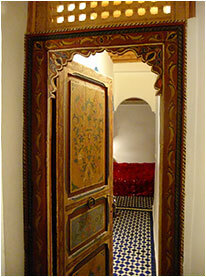 And finally, we look forward to welcoming you to Dar Sienna!